Clematis urophylla 'Winter Beauty' is growing on a treat right now on our nursery, and sure to make a lot of gardeners very happy this winter. Winter Beauty is a new introduction that is sure to become a mainstay for all gardeners wishing to bring winter scent and colour to their gardens, enchanting us with seductive blooms from December through to the end of March. These are of course traditionally the dullest months of the year, so this plant breaks all conventional gardening rules, and with the evocative name 'Winter Beauty' also makes a great Christmas gift for someone special. 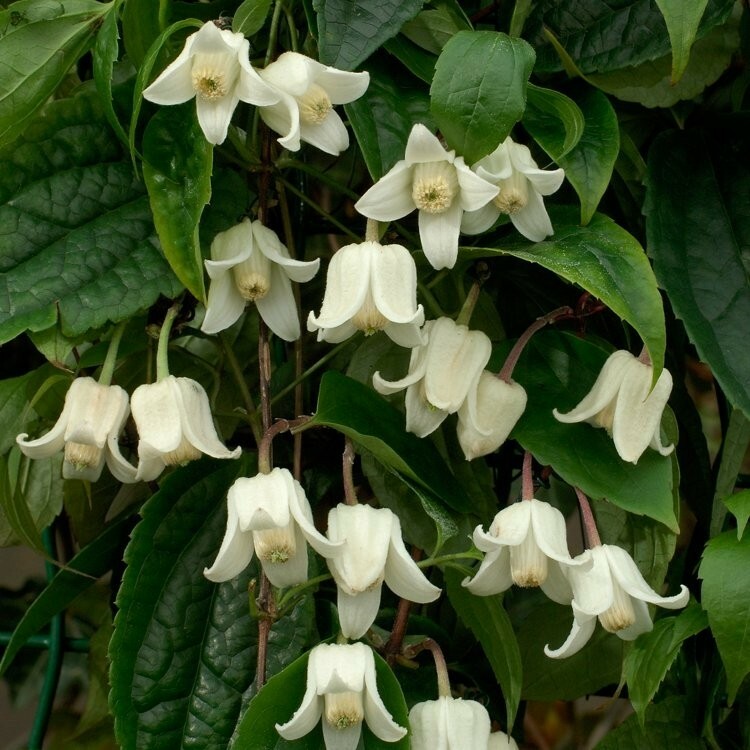 'Winter Beauty' Clematis owes its strong constitution to its parentage - mother plants bred over several generations to produce the ultra healthy, hardy plants. 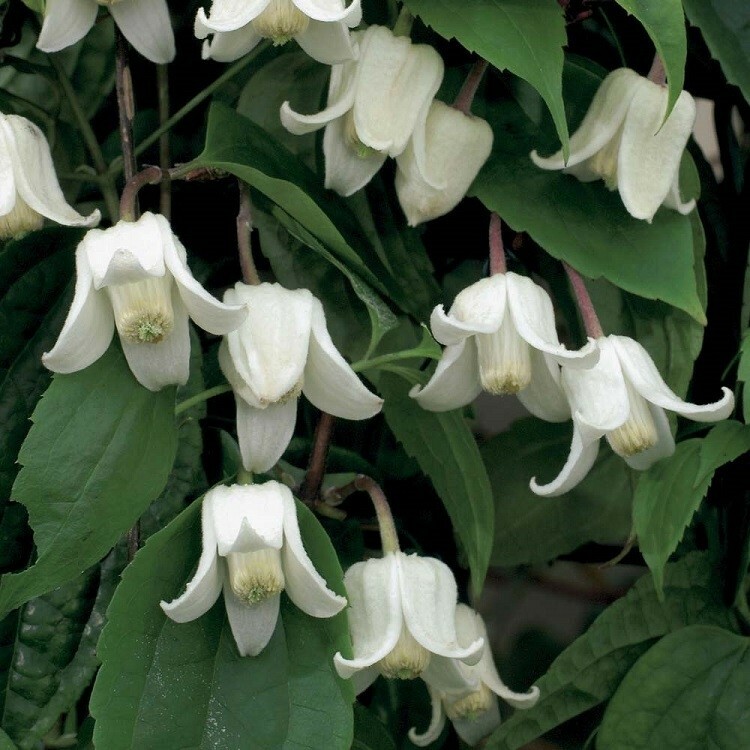 Unlike some Clematis that can suffer from wilting disease, this variety has been tested and proved itself to be completely resistant, displaying large, attractive evergreen foliage that is always a bonus on those dark winter days, and as a backdrop to other plants in the summer months. The real interest is of course the flowers - in December, the plants are loaded with buds, they appear en-mass and are lovely shades of soft creamy lime, hanging amongst the foliage like small bells, they are poised with energy to continue blooming and bring joy to the gardeners heart throughout the dullest, shortest days. These buds themselves make a fantastic show, but the real jewel in this plants crown is a little later. From mid-January, to the end of March, the 'Winter Beauty' bells burst into life, the bells opening one by one into bright white flowers, as white as the winter snows that it will simply shrug off, and to top this off is a tremendous scent. A rich, vibrant fragrance to every bloom combines together to create something extra special in the cool winter air that will stop passers by in their tracks. We recommend, if you can, that you have at least one of these planted by the front door if at all possible, not only will you be able to enjoy the scent yourself every day, but any guests in winter will appreciate this plant, and be sure to pass on their praises to your green fingered prowess. 'Winter Beauty' will grow well in all free draining soils, is highly ornamental over a long period when little else is on flower, and will surprises everyone with each bloom and its outstanding fragrance. Growing approximately three metres tall and two metre wide when fully grown, yet easy to keep more compact if required. Supplied in approx 2-3 litre containers, full of bud/bloom from December-late March. Please be sure to order quickly as we expect demand to be very high, and supply is limited. IF YOU BUY JUST ONE CLIMBER FOR YOUR GARDEN THIS WINTER - CHOOSE 'WINTER BEAUTY', FOR JUST £29.95 EACH, THIS IS A REAL INVESTMENT FOR YEARS TO COME.